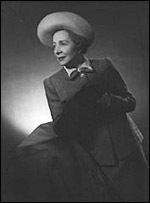 Justly celebrated stage star (from 1912) of classic and modern roles (at Stratford, the Old Vic, the West End, Broadway), made DBE in 1946 and loaded with honorary doctorates (London, Oxford, Cambridge), Edith Evans went on to accrue almost comparable honours as a screen character actress. For those who never saw her on stage, her definitive performance as Lady Bracknell was carefully preserved, like a fly in amber, in Anthony Asquith's The Importance of Being Earnest (1952): the magisterial bearing, the vowel-heavy delivery ("a ha-a-a-andbag? "), the total command of the mise-en-scène, are wonders to behold, but the transition to screen has been truly made. She made three long-forgotten silent films (though East Is East , 1916, has its admirers), then over 30 years later returned to mesmerise filmgoers with her role as the ancient countess who has sold her soul for success at cards in The Queen of Spades (d. Thorold Dickinson, 1949). It is one of the great performances in a British film; so, too, is her tiny role as Ma Tanner in Look Back in Anger (d. Tony Richardson, 1959), or an outraged Miss Western in Tom Jones (d. Richardson, 1963), or the imperiously dotty Mrs St Maugham in The Chalk Garden (d. Ronald Neame, 1964) or the frightened old lady in The Whisperers (d. Bryan Forbes, 1966). She acted until she died, in films not always worthy of her, a curiously solitary figure crowned with laurels of every kind.